Kerry Hanson is a research chemist at UCR. She studies how the molecules in sunscreens work to protect the skin from ultraviolet (UV) light from both the sun and tanning lamps. Dr. Hanson's work has helped sunscreen companies realize the importance of using antioxidants in their products to protect against UV-induced Reactive Oxygen Species (ROS). These molecules can cause cell damage if the skin gets too much UV exposure. She has written about how sunscreens work for The New York Times and Washington Post, and she is an active volunteer for the SunWise program at Taft Elementary. Allison Mackenzie is chief executive officer and a member of the board of directors of Babcock Laboratories, Inc., a Riverside-based commercial lab specializing in environmental and food product testing. Ms. Mackenzie has over 38 years of experience in the environmental laboratory business, including 23 years as vice president and general manager, and 8 years in analytical method development for both inorganic and organic determinations in drinking water and wastewater. Ms. Mackenzie holds a Bachelor of Arts in Biology from the University of California, Riverside. In her role as CEO, Ms. Mackenize actively works to promote and advance the health and growth of the company and its staff. She is an advocate for high ethical standards and quality in the testing industry, and serves as a member on the Environmental Laboratory Technical Advisory Committee for the California Environmental Laboratory Accreditation Program. Dr. Takesha J. Cooper, M.D., M.S. is an assistant clinical professor of psychiatry at the UC Riverside School of Medicine and a child and adolescent psychiatrist at the Riverside County Department of Mental Health's Lake Elsinore Family Mental Health Services, where she holds an administrative role as the Associate Medical Director for Riverside University Health System. She is also the associate program director of the Child and Adolescent Psychiatry Fellowship Program. Cooper earned her B.S. in biochemistry and molecular biology from UC Santa Barbara, then came to UC Riverside to earn a master's degree in the fields. She then attended the Keck School of Medicine at USC to earn her M.D. She conducted her residency at the San Mateo Psychiatry Residency Training Program and completed a fellowship in child and adolescent psychiatry at the Stanford University Hospital and Clinics. She is board certified in child and adolescent psychiatry and general psychiatry, and is a member of the American Academy of Child and Adolescent Psychiatrists, the Southern California Psychiatric Society, the American Psychiatric Association and the American Medical Association. Julianna Adams is a Senior Civil Engineer with Riverside County Flood Control and Water Conservation District. Mrs. Adams, a licensed Professional Civil Engineer, has worked on several projects in both the Planning and Design Sections at the District, most recently completing the design of the Arroyo del Toro Channel Project in the City of Lake Elsinore. Shortly after completing the $6 million design project she was transferred to the Watershed Protection Section to assist the cities and County of Riverside meet the requirements of the Santa Ana Region and Santa Margarita MS4 Permit. Mrs. Adams holds a Bachelor’s of Science in Civil Engineering from California State Polytechnic University, Pomona, and a Master’s degree in Public Administration from California Baptist University. She has been actively involved, at different levels, in the American Society of Civil Engineers, a professional society geared towards transforming young civil engineers into future leaders of the profession. Adams is proud to say that she was the first in her immediate family to graduate high school and the first in her extended family to attend a university. She is thrilled to have set a new path in her family and expects that by setting an example more will follow. Catharina E. Santasilia is an archaeologist and doctoral candidate in the Department of Anthropology at UC Riverside. She earned a bachelor's degree in Egyptology and a masters degree in Native American Studies from the University of Copenhagen before moving to Riverside in 2014. Her research interests are Preclassic Central Mexico, mortuary practices, monumental archaeology, museology. For her dissertation research, Catharina is focusing on the Early Preclassic/Formative period in Central Mexico, including the site of the Tlatilco, a people and culture that flourished in the Valley of Mexico from 1200 to 900 BCE, more than 2,000 years before the Aztecs came to power. She is showcasing Tlatilco artifacts from the Riverside Metropolitan Museum for an upcoming exhibit called Uncovering Ancient Mexico: The Mystery of Tlatilco, which will open at the Riverside Art Museum on February 3. Her talk will emphasize how advances in science and technology serve to preserve history and art and help her and other scientists interpret the past. Leslie Wickman has worked as a researcher, teacher, and administrator, both in academia and in industry. She received her PhD in human factors and biomechanics from Stanford University and was Program Director of Engineering and Director of the Center for Research in Science, both at Azusa Pacific University, before joining the faculty of the Gordon and Jill Bourns College of Engineering at California Baptist University here in Riverside. Dr. Wickman's industry experience includes work at the Aerospace Corporation, the RAND Corporation, and Lockheed Martin Missiles and Space. Her work there centered on the U.S. human spaceflight program, and she is a trained EVA/IVA test astronaut with over 100 hours of test time in a NASA spacesuit and has an FAA private pilot's license. Angelov Farooq is elected to the RUSD school board, and he is a partner at the Omnius Group, a sustainable development company. Dr. Farooq is also the founding director of the UC Riverside Center for Economic Development & Innovation and serves as a faculty member in the UCR Graduate School of Business. In 2013, Governor Brown appointed him to the California Workforce Development Board. He was also appointed by California’s Chief Financial Officer, Controller Yee, to the Council of Economic Advisors to focus on shaping tax reform. A proud native of Riverside County, Dr. Farooq earned his Bachelor's Degree from University of California, Berkeley, and a Master’s Degree and Doctorate of Policy, Planning and Development from the University of Southern California. 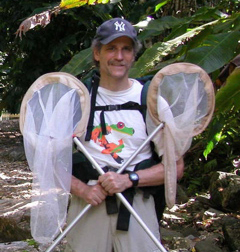 David Reznick studies the process of evolution by natural selection from an experimental perspective. He also tests evolutionary theory in natural populations, primarily guppies from the Caribbean Island of Trinidad. His results show that evolution by natural selection can be remarkably fast—on the order of four to seven orders of magnitude faster than scientists infer from the fossil record. Dr. Reznick has earned numerous honors for his work, including membership in the American Academy of Arts and Sciences. He also just completed a one-year Guggenheim Fellowship at Oxford University. Dr. Reznick’s book, The Origin Then and Now: An Interpretive Guide to the Origin of Species, is a great way to learn more about his work and thoughts on evolution.